Since 1994 Saldana Racing Products Sprint Car Radiators and Fuel Tanks are the choice for top racers. Check out the Recently Listed Fuel Cell/Tank Components. Pit Stop USA is The Online Motorsports Superstore! We feature Fuel Filters at low everyday prices. Pit Stop USA is The Online Motorsports Superstore! We feature Mini Sprint Radiators at low everyday prices. Pit Stop USA is The Online Motorsports Superstore! We feature Mini Sprint Wheel Nut Wrenches at low everyday prices. Pit Stop USA is The Online Motorsports Superstore! 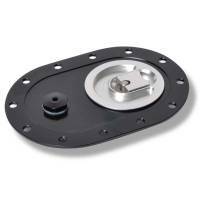 We feature Oil Tank Mounts at low everyday prices. Pit Stop USA is The Online Motorsports Superstore! We feature Radiators at low everyday prices. Pit Stop USA is The Online Motorsports Superstore! We feature Valve Covers at low everyday prices. Pit Stop USA is The Online Motorsports Superstore! Saldana Racing Products started in 1994 and in 1995 nationally famous and Knoxville Nationals winning sprint car driver Joe Saldana sold the company his racing fuel tank business. Joe was well established and respected in the industry so in Jan 1996 Saldana Racing Products was born. In 1998 Saldana Racing Products expanded again when they bought the racing fuel tank business of Fuel Bladders, Inc. (FBI). Since that time Saldana Racing Products has never looked back. Saldana Racing Products have added many items to their product line. In early 1997 Saldana Racing Products started manufacturing sprint car radiators and slowly they expanded the radiator shop to include radiators for carting, drag racing, late models, midgets, and mini-sprints. Saldana Racing Products have also added street rod, hot rod, off-road racing, and a near endless list of custom radiators for consumers or private label distributors. Saldana Racing Products has always had their eye out for new product ideas and continue to introduce new products every year. Saldana Racing Products think that they have been able to achieve their success by taking care of their customers needs. Saldana Racing Products takes great pride in their ability to produce very high quality aluminum radiators at a fair price. 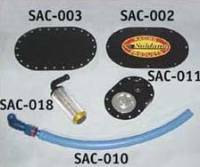 Saldana Racing Product offers Saldana Sprint Car Radiators, Saldana Mini-Sprint Radiators, Saldana Dry Sump Oil Tanks, Saldana Oil Tank Brackets, Saldana Valve Covers, Saldana Wheel Wrenches, Saldana Fuel Cells, Saldana Fuel Tanks and much more! We feature Saldana Racing Products at low everyday prices!